Six-Max and Heads-Up cash tables. Variety of Sit & Go tournament types. Discover statistics on the table (average pot size, who's sat down etc.) before you take a seat. Find a player option. Play from browser or download (iOS). Watch SkyPoker TV from the app. Sky are one of the largest and most well-known companies operating today in the UK. They were founded in 1990 as a satellite TV services provider, but have since branched into phone and broadband and of course, online gambling. The company runs five online gambling concerns: Sky Bet, Sky Casino, Sky Vegas, Sky Poker and Sky Bingo. Sky Poker launched in February 2007, and uniquely included coverage of the games and tournaments they offered on one of their Sky TV channels. Sky Poker still broadcasts every Tuesday, Thursday and Sunday on Sky Channel 861, or via a live stream at the company's web site. 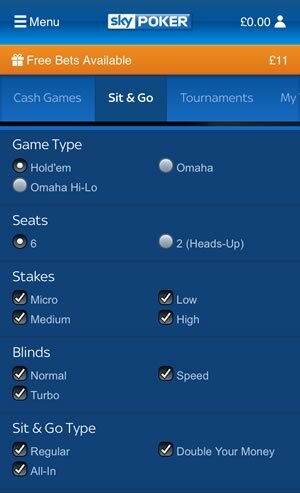 Sky Poker offers a dedicated poker app for iPad and iPhone players. This article will detail how you can obtain the app on your iOS-powered device. 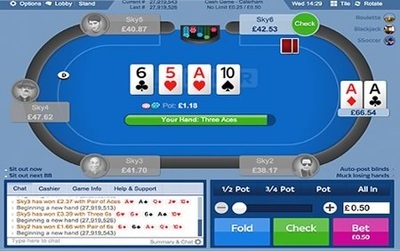 There is not currently a Android-based version of the app (and Sky say they have no plans to develop one), but Android (and Windows Phone Poker and Blackberry Poker) users can still play on their devices via a browser. 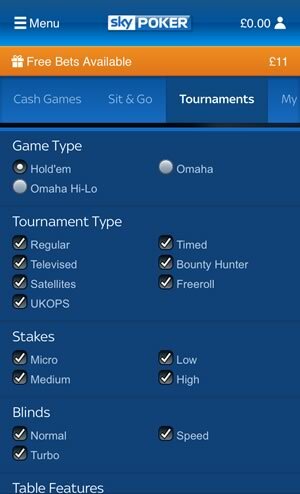 You will need to register for a Sky Poker account before you can download and play on the Sky Poker mobile app. The easiest way to do this is by visiting the desktop Sky Poker site. In the top left hand corner of the landing page you will see a link marked 'Register'. Click on this to be taken through to the registration page. Fill in all the personal information that is requested, then click 'Continue to Step 2'. Here you will have to fill in a few more details, including setting up your security information. Once that is complete, you need to register your credit card – both Visa and MasterCard cards are accepted. Finally, once you have completed all this, you can complete your Sky Poker registration. iOS Devices: There is only one way of obtaining the iOS-powered version of the Sky Poker mobile app for your iPhone and iPad, and that's to visit the Apple App Store. Once you are at the iTunes store, search the store for 'Sky Poker' to obtain the download link. You will then be able to download and install the app to your iOS-powered device. The app is optimized for iOS 8 and iPhone 6 and 6+, however it will work on all devices running iOS 6 or later, and is compatible with iPhone, iPad and iPod touch. Android and other Devices: As stated above, Sky Poker does not and has no intention of creating a separate mobile poker app for Android users, however, mobile users who do not have a iPhone or iPad are still able to play at the Sky Poker site. This can be achieved by visiting m.skypoker.com and playing via the browser-based app. Easy to find a suitable table – just set your parameters and allow the app to find a vacant seat for you. 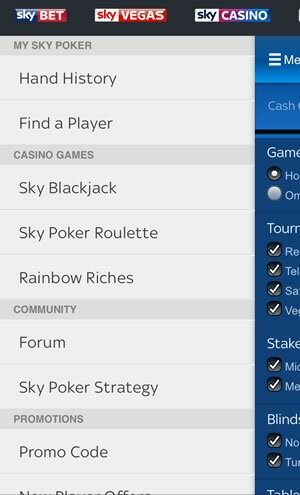 At present, the only thing that the Sky Poker App lacks is the ability to multi-table, but Sky say they are working on that to add it to the app sometime in 2015. The app itself looks very appealing and functions well, although the table can become a little cluttered during play. It is best to use a tablet when playing with the app, although the screen is optimised when you play using a smart-phone – it is not just a version of the tablet screen at a lower resolution. All the controls are easy to use in what is a very well-designed app. The Sky Poker mobile app offers new players a tasty double option with a sizeable 200 percent first deposit bonus up to £500 and £10 absolutely free. The £10 free is given in the form of four free tournament tokens, which you obtain by using the promo code 'POKER' when you sign up. These tokens are two £2.20 tokens and two £3.30 tokens, but you can combine them to enter a tournament with higher buy-ins if you so wish. The 200 percent first deposit bonus up to £500 is released in £10 increments over your first thirty days of playing using the Sky Poker mobile app. You 'earn' £10 for every 250 Poker Points you obtain. Poker Points are gained by playing in ring games, MTTs and Sit & Gos. You earn six poker points for every £1 in rake you contribute while paying ring games, and ten poker points for every £1 you pay in tournament fees. As a Sky Poker customer, you will be eligible for plenty of other incentives, promotions and cash rewards, including possible entry into the annual Sky Poker UK Poker Championships with a guaranteed prize fund of £1,000,000! 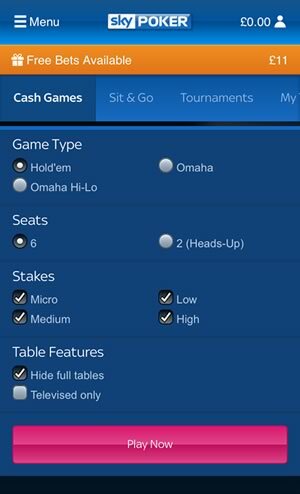 It has to be said that the Sky Poker Mobile App is a little lacking in funding options. When you register your account with the app, you are required to register a credit or debit card, which will remain as your main method of withdrawing and depositing. You can use PayPal as an alternative, but this is not an option with the mobile app. There's very little to be said against this app, aside from the lack of a dedicated Android version and the multi-tabling facility. It's great to see an app that offers Omaha alongside the poker behemoth that is Texas Hold'em, and it's just as great to see that ring games, multi-table tournaments and sit & gos are all included. That £10 free and max £500 bonus just go to make this app even the more enticing. If you are serious about playing poker on the go, then the Sky Poker mobile app really should be downloaded to your iPad or iPhone as soon as possible.